RapidLash eyelash enhancer by Promaxyl is appreciated by consumers. Another eyelash growth serum in a silver tube. Its design isn’t surprising. You will find lots of info about the effect on the cardboard box. Do these numbers have reflection in reality? Check if RapidLash is worth your attention. It has innovative formula and very good eyelash growth properties. RapidLash eyelash enhancer contains patented ingredients called Hexatein 1 Complex. The name sounds mysterious but these are just substances that reinforce your lashes and stimulate their growth, including vitamins, oils and plant extracts. 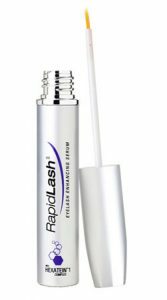 RapidLash Serum works both for women and men who want to strengthen their thin and short lashes. Theoretically, the applicator is the same as in other serums. You use the brush to spread the serum on the lash line but it doesn’t have soft bristles. That’s why it isn’t so easy to perform a precise application. You must try to apply the serum directly to the lash line. The application must be repeated every evening, always after cleansing and drying the eyelids. It is another eyelash serum that works exclusively for eyelash care. It is available at drugstores and online. If you want full care for lashes and brows, you must buy extra serum – RapidBrow. Both products are quite costly. The price of RapidLash eyelash enhancer could be lower – the product isn’t cost-effective whereas the effects are unimpressive. Many women are dissatisfied with the results of RapidLash treatment. – quite intensive reinforcement and nourishment.